The Wolf Spider didn’t get its name because it howls at the moon, disguises as your Grandma, or blows down pig dwellings. Rather, the nocturnal Wolf Spider is an agile hunter, searching out and consuming its prey at night instead of luring it into a web, like other spiders (and yes, like a wolf). Wolf spiders are speedy little spiders; they have been known to move at a speed of two feet per second. 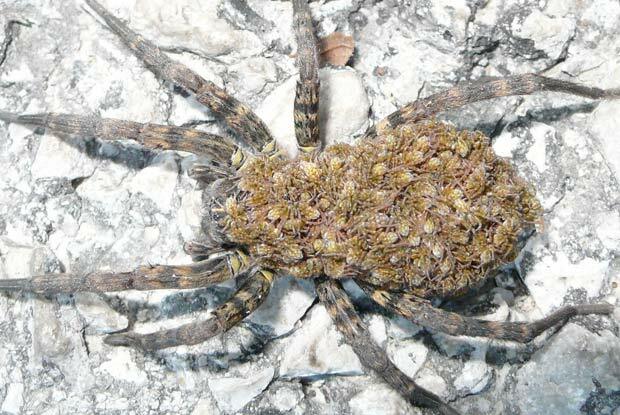 The full-grown Wolf Spider ranges in size from ½ inch to over an inch, and up to 4 inches when legs are spread. It is gray to brown in color with bristles on its body and legs. The Wolf Spider has an excellent sense of sight, perhaps related to its nocturnal hunting habits. Wolf Spiders have eight eyes (yikes!) arranged in three rows: the top row contains two medium-sized eyes, the middle row two large eyes, and the bottom row 4 small eyes. The eyes of a Wolf Spider also have reflective properties; if light is shined in their eyes at night they will produce a sort of glow that is easily distinguishable. Because Wolf Spiders are hunters, they tend to be colors that blend in to their habitat. Camouflaging themselves for protection while on the hunt for prey, Wolf Spiders do not display bright colors like some other spider species. Most Wolf Spiders have white or black markings or lines on the upper side of their bodies. Wolf Spiders are venomous in the sense that they will eject venom into their victim with their bite, but a Wolf Spider bite is rarely dangerous and not lethal. The Wolf Spider is aggressive more to insects than to humans, but if provoked will bite humans. Symptoms of a Wolf Spider bite include swelling, mild to sharp pain, and itching. The bite of a Wolf Spider has been likened to a wasp sting. Necrosis, or tissue damage, has been reported in conjunction with the bites of some South American species of the Wolf Spider. These instances, however, are most likely attributed to misidentification of the species.